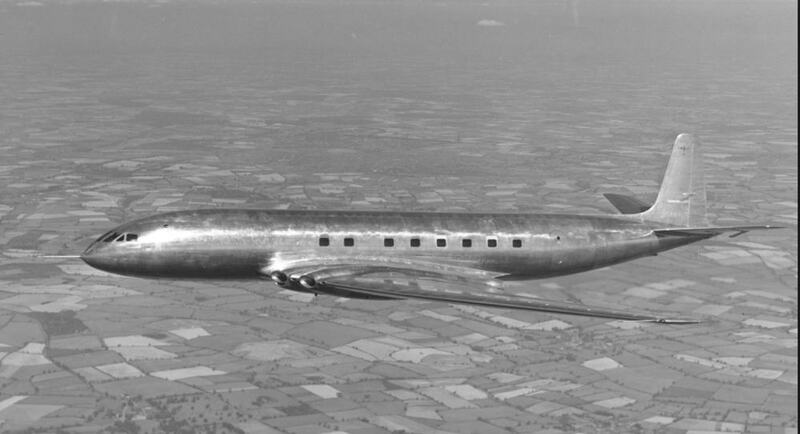 July 2019 is the 70th Anniversary of the De Havilland Comet inaugural flight, designed by Sir Geoffrey de Havilland and built in Hatfield. It was the first ever jetliner to go into commercial service beating the Boing 707 by 6 years. This anniversary serves as a timely reminder to the importance it had with the development of international air travel and the impact on resurrecting the economy at the time just after WW2 which left the United Kingdom with a depleted population and economy. Designed and built in Hatfield the Comet’s sleek, smooth lines were especially aesthetic with the four jet turbine engines set into the base of the wings near to the fuselage. This gave excellent stability and doubled the speed of any commercial aircraft at the time with half the noise of the equivalent piston engine propelled aircraft. The Comet would fly higher than 30,000 feet above most weather conditions and air turbulence where the air is thinner enabling the engines to run more efficiently. An innovative design of large square windows enhanced the passenger experience with spectacular views as they flew to their destinations and the speed of travel helped the Comet become very popular very quickly. It could carry between 36 to 44 passengers depending on the route, but proved economically viable with only 43% occupancy. 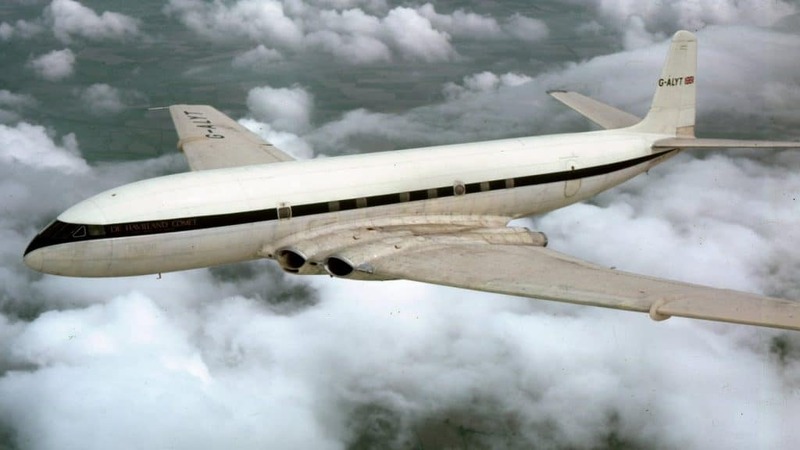 On May 2nd 1952 the Comet started in service with UK’s flagship airline company BOAC, from London to Johannesburg and carried over 30,000 passengers in the first year. Other airline companies placed orders for the Comet, including PanAm and Japanese Airlines for their long haul routes. 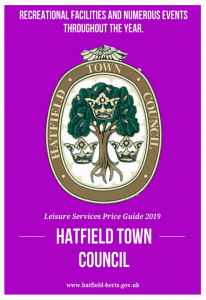 It was a good time for the British economy and was based around the production plant at Hatfield. But on January 10 1954 on a scheduled flight from Rome to London the oldest Comet in service with over 1290 flights broke up in mid-air and crashed in to the Mediterranean Sea. There was no warning, no radio contact and the only witnesses were fisherman who reported a loud explosion and the debris falling into the sea. The Comets were quite rightly grounded with all flights cancelled. Extensive tests took place, checking the likely causes over and over. Without evidence or any indication of what caused the problem there was not much more could be done. Over 60 modifications were made to what might have been the likely cause and after 10 weeks the Comet fleet was back in service. Three weeks later in April 1954, a Comet flown by South American airways on a flight from Rome to Egypt broke up after 20 minutes in flight just past Naples, killing all on board. The Comet’s Airworthy Certificate was withdrawn which more or less meant the end of the aircraft. The complete but short history of the Comet was studied and two other incidents were discovered but the cause recorded as Pilot error. However, the project was worth too much to be written off. Extensive investigations were launched. A massive water tank was constructed to take the whole fuselage of the Comet. This was considered a much safer test environment as water cannot be pressurised as air and being less volatile would react differently in the event of an explosion. Filled with water, the cabin was pressurised and de-pressurised to simulate the stress on the materials would be expected undergo in flight conditions, something that had been done many times before in the laboratory. Metal is know to expand when pressurised and its’ accepted not to be able to return back entirely to its original quality. This is metal fatigue and its this reason there is a limit on the amount of flights an aircraft can make before it is scrapped. The thin Aluminium used on the Comet was tested extensively and chosen because of the excellent results of test and the lightweight quality the material brought affording more efficiency in flying costs. After 1000’s of simulated flight hours, way past the prescribed amount of flying ours shown on the Airworthy Certificate, de Havilland and air crash investigators (Royal Aircraft Establishment) got their explosion through metal fatigue which they were able to compare with wreckage recovered from one of the crashes in the Mediterranean, the findings were incredible and not what they expected. The metal fatigue was originated from the joins of the square window frame and an escape hatch with the material actually splitting or tearing along the seam where rivets had been used which were punched into the material. It was a design fault. Circular or Oval windows do not have these weaker stress points in the corners and for this reason all aircraft have been designed since with curved frames. Rivets, at least those available then were not punched into the material but special adhesive and screw type fastenings were brought into operation. The Comet regained its Airworthy Certificate and the ‘Comet 4’ was built and flown again by leading airline companies. By this time, of course the other Jet Airline manufacturers had caught up and air travel took on a completely different meaning in safety and travel times. It all started in Hatfield.